I have been using the Bannatyne Hide Bag, which is available in a range of sizes to suit individuals, for over a year now. At the same time, I started to use the Bannatyne Canister Moisture Control System, developed in conjunction with Willie McCallum. The Moisture Control System with its ‘see-through’ Canister and gels that change colour, letting the player know on inspection when it it’s ready for changing, or just to monitor, is a revolutionary breakthrough. Pipers of all abilities and ages will benefit from the easy installation and comfortable playing position the bag provides, giving the piper complete satisfaction during performances. Currently I am playing an Extended Small Bag and am trialling the WMC shape. Having played the bag and system for over a year at a real intense level of practice and performance, I would say that once the player gets to know their own moisture levels and how long they can play in any one practice session or performance, they will enjoy the benefits. I fully recommend you give the Bannatyne bag and Moisture Control System a go, you won’t be disappointed. At the age of fifteen Gordon won his first professional contest, and at sixteen he became the youngest recipient to win The Argyllshire Gathering Silver Medal for piobaireachd in 1985. This of course established him on the competing scene and countless success’s were to follow, many several times over. 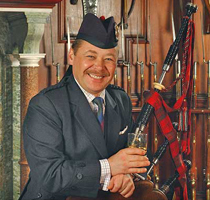 He passed his Army Pipe Major’s Certificate with distinguished honours at Edinburgh Castle and holds all the necessary teaching certificates from The Institute of Piping. He was the senior instructor at both The College of Piping and The National Piping Centre, and now directs the piping programme at St. Columba’s School, Kilmacolm. A seasoned competitor and prolific major prize winner, the term won them all springs to mind , Bratach Gorms, Glenfiddichs, Silver Stars, Gold Medals, Clasps you name it the list goes on. Gordon of course is well respected and is equally at home on the competition stage as he is on the recital platform or concert stage where he royally entertains. He is Pipe Major of ‘’The Mauchline & District Caledonia Pipe Band’’ located in his native Ayrshire, and play’s a David Naill bagpipe with a McCallum chanter.